Defence Headquarters on Thursday denied reports that Nigerian troops had been deployed to Benue State following deadly attacks on Fulani in the state. Panic spread quickly across Benue on Thursday after images surfaced online of a convoy of troops riding along major roads in the state, where several attacks linked to farmers-herders crisis have been recorded in recent weeks. 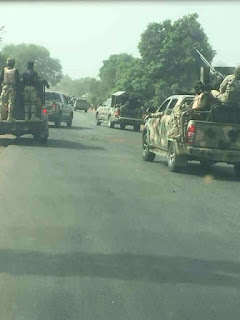 Some newspapers also reported the images and quoted a spokesperson for 707 Special Forces Brigade in Makurdi as confirming the deployment and assuring Gboko residents of their safety. The Defence Headquarters, however, insisted to PREMIUM TIMES in a follow up enquiry Friday morning that there was no contradiction between its account Thursday night and the statement by the 707 Brigade spokesperson that troops were indeed on ground in Makurdi Thursday. PREMIUM TIMES learnt from Gboko residents that the only soldiers seen around the predominantly Tiv town as at Friday morning were those working with the police in Operation Zenda. “Those ones have always been around because they mixed with police when Operation Zenda was launched to combat herdsmen attacks some years back,” a resident said. The police identified the victims as Fulani who were travelling to Kogi and Taraba States. They were killed at a motor park by suspected Tiv thugs who burnt their remains, police said. The state police commissioner Fatai Owoseni said suspects had been taken into custody in connection with the killings. Governor Samuel Ortom had also imposed a dusk-to-dawn curfew in Gboko and charged security operatives to ensure prompt arrest and prosecution of all suspects. The state government also increased a ransom for the most wanted militiaman in the state from N10 to N50 million on Thursday.